What is right and what is wrong and who gets to decide? Is it ok to build a new coal mine that will damage the environment if it brings jobs and prosperity? What if a proposed development that will provide houses for an expanding population is opposed by a community group trying to protect habitat for koalas? There are always two sides to every argument and most often there are many different views on an issue. Yet any rational person will accept that all of the arguments need to be heard and, especially when they are legal matters, that both sides are able to access adequate support and legal representation. Indeed, access to justice is the cornerstone of a fair and just society like ours. I'm sure access to justice is as important to you as it is to me, and that you know how important it is to ensuring an equitable, healthy and transparent society. As ordinary people try to participate in the legal system, they are often overwhelmed and struggle to have their voices heard. So when I see an individual, community group or farmer confronted by a big company and their well-resourced legal team, I know exactly how I feel, and maybe you can guess! Fortunately there is a solution. For over 20 years I've worked at the Environmental Defenders Office Queensland, the one place that anyone in the community can contact to seek advice and support for environmental legal matters. We help ordinary people gain access to justice and assist with their legal representation in court. Almost every day we receive emails and calls from people seeking advice and support. Every Tuesday and Thursday evening from 5.00pm to 7.30pm we staff our community legal advice line and the phone rings constantly. Through providing this essential service we've helped thousands of individuals and community organisations and yet, this very service is now in jeopardy. We are experiencing an unprecedented funding crisis. The Environmental Defenders Office Queensland has had all of our State and Federal government funding cut without warning and if we are to continue to provide access to justice, we need your support. If I can't raise a minimum of $120,000 by 30 June, I'll need to make tough decisions on the continuation of our access to justice services for environmental legal matters. Over the past six months we've managed to keep things going, but this cannot continue beyond early July, when the decision on the future of our access to justice services needs to happen. Will you help the Environmental Defenders Office continue to provide access to justice? Please, will you make a tax-deductible donation by June 30 to keep the Environmental Defenders Office alive? 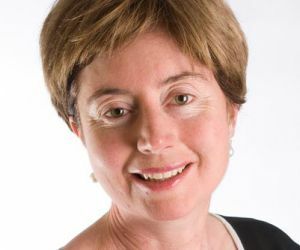 Governments at a State and Federal level have said they will 'cut green tape' and the Federal Government wants to hand over development assessments to the Queensland Government. The Australian Government also says it will introduce bills to repeal more than 10,000 pieces of legislation and regulations, many of which protect our environment. This is the same Federal government which, on 17 December 2013, advised without warning that it was withdrawing $350,000 in annual funding for the Queensland Environmental Defenders Office. This defunding also comes at a time when a number of contentious coal, coal seam gas, LNG and other projects are in the development pipeline. These projects are in highly sensitive areas such as the Great Barrier Reef and precious farmland. They affect many communities, including remote Indigenous communities, as well as the environment. Right now the Queensland mining industry is booming at an unprecedented rate with over 30 proposed coal mines, 30,000 proposed coal seam gas wells and new and expanded ports on the Great Barrier Reef (pictured below). Uranium mining is also now permitted. Our support helps landholders, individuals and community groups to understand and act on their legal rights. This in turn protects the natural environment and communities against the impacts of major coal mines and massive coastal developments. We're committed to keep providing these services for free in the interests of access to justice; however, without government funding our hands are severely tied. Your support is essential if we are to provide this vital legal service which is relied on by individuals and communities. To keep operating, we need funds for staff wages, rent, internet, and telephone - the basic essential costs to keep the access to justice service alive. This will ensure we can keep the community legal advice line operational, provide our free legal information seminars and advocate on urgent law reform such as protecting long-standing community legal rights to object to proposed mines, and much more. There are so many examples of inequity in the cases we run. However I'll choose this one as an example of what's faced by those that want to put up a challenge to the big end of town. Clive Palmer, businessman and now Member for Fairfax in the Federal Parliament,is the owner of Waratah Coal. 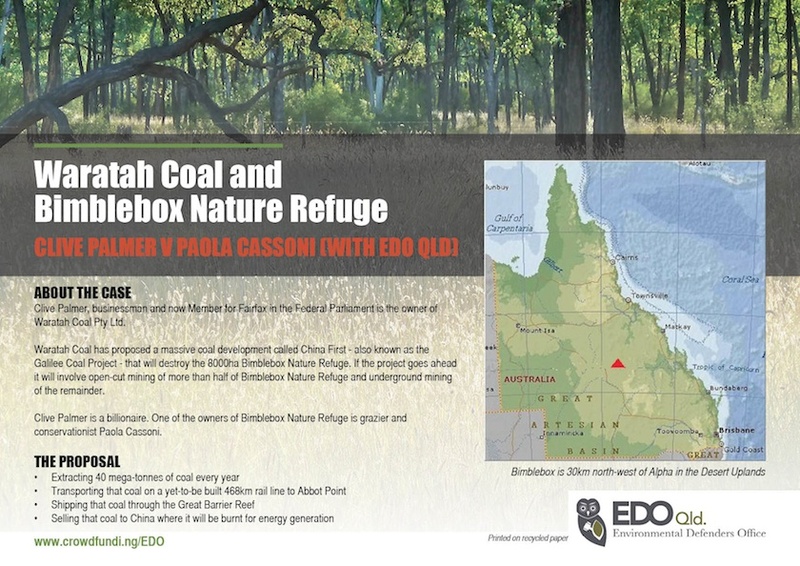 His company has proposed a massive coal development called China First in Central Queensland that will destroy the 8000 hectare Bimblebox Nature Refuge. Clive Palmer is a billionaire. One of the owners of Bimblebox Nature Refuge (pictured below) is grazier and conservationist Paola Cassoni. Paola was shocked when she learned of the potential destruction on Bimblebox. “First I didn't know what to do and then we were told about the EDO. They guided us through the legal process and helped us to understand and respond to environmental impact statements and issues like mining and groundwater, what's lawful and what's not. For me it's been tough, a big fight, but so far we've managed to keep going. The EDO - I don't know what we'd have done without their support." 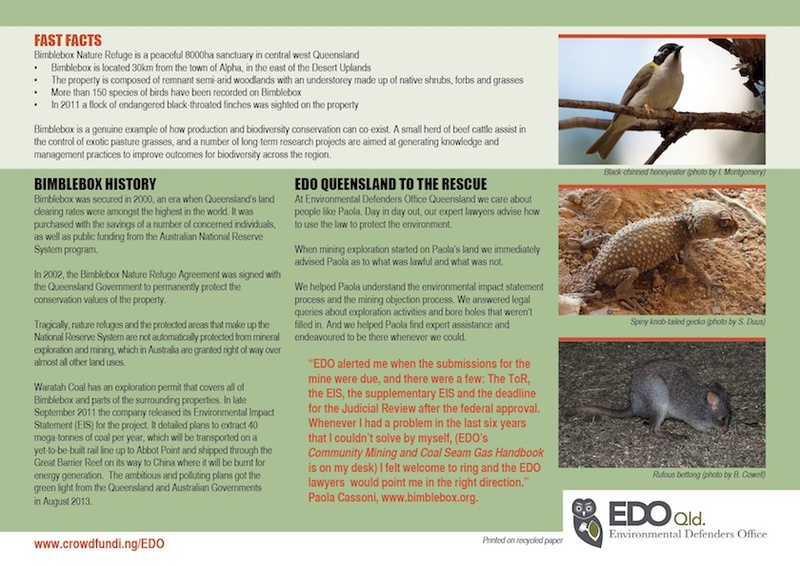 The Environmental Defenders Office Queensland is the only organisation which helps ordinary people with advice and support for environmental legal matters. If there is no free legal support available it will mean ordinary people seeking environmental justice will have no one to turn to. They will effectively be locked out of the legal system. Help the Environmental Defenders Office continue to provide access to justice. Please, will you make a tax-deductible donation by 30 June to keep the Environmental Defenders Office alive and thriving? We can all have a view on any issue but to me, some things are not negotiable. The right not only to have your say, but to have equal access to the opportunity to do so. Our society is built on these fundamental principles. The Environmental Defenders Office is essential in bridging the gap. “I've been continually impressed by the Environmental Defenders Office as a legal organisation. They take to heart Charles Houston's dictum that lawyers acting for community organisations have to make sure that they are better lawyers than those acting for the powerful. The EDO ensures decisions in the area of environmental law are made well." I can assure you your donation to the Environmental Defenders Office will have an immediate impact. The Environmental Defenders Office Queensland is a non-profit, Incorporated Association with a strong identity in the local community of Brisbane's West End. If you came to our office, you'd see and feel that grass-roots element. While as Principal Solicitor, I've been here for 20 years, we've also had over 140 solicitors and law students working as paid staff, pro bono contributors and enthusiastic volunteers, eager to learn and help. In the next 12 months, will big business and mining interests have their way and go unchallenged? In this David and Goliath struggle, will we hear but a squeak from the little guy? Please, can you make a tax-deductible donation by 30 June to keep the Environmental Defenders Office alive? 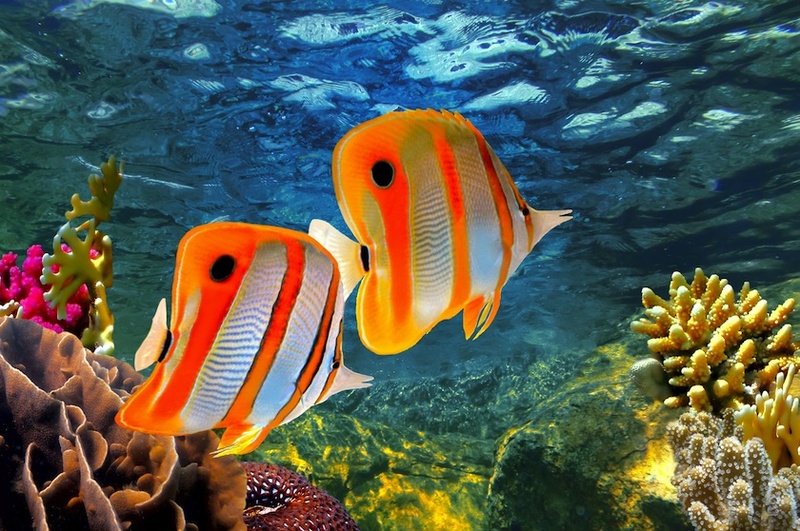 If we're gone, have disappeared, who will represent the voices speaking for the Great Barrier Reef and on vitally important issues like climate change? Who will support community groups protecting threatened species and farmers challenging the imposition of coal seam gas on their land? Please join me in supporting access to justice by making a tax-deductible donation to this special end of financial year appeal. PS. This really is a time of big decisions. Before 30 June, please choose to support the Environmental Defenders Office Queensland in our mission to provide access to justice. Please choose to help us reach our minimum target.